I’m taking stock of my knitting. I have a habit of casting lots of things on, then setting them aside when I get distracted by the next shiny thing. Last Christmas I was in a similar sort of situation and I did make an effort and try and get several things finished properly. So this year, I’m taking a similar approach. I have – much to my surprise – only 3 wips at the moment. 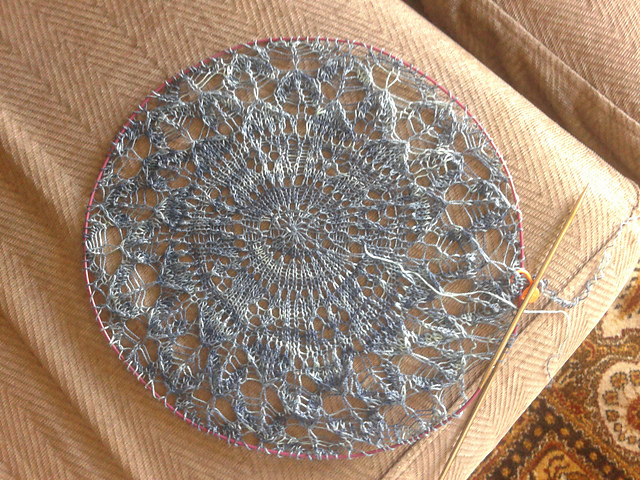 Incredibly dull to knit, hence the delay in actually getting anywhere with it. The stitch pattern is complicated enough that you have to pay attention but completely uninteresting so you get bored rather quickly with it. According to my notes – I started in early 2011 and picked it up again in November-December 2011, and again in March 2012. One sleeve is done and the second is started. The main body needs a back and left front panel and collar. Plus all the seaming. Fingers crossed this gets finished, as I do actually like the look of the knitted fabric. The bamboo tape has a lot of drape too which will work with this pattern even if it stretches considerably. Got one sock finished very quickly and just never got around to getting the other one done -oops! The most recent wip and the one I’m least irritated by, given that it is 1500m of laceweight with several thousand beads attached. This one is going to take time. And while I’m up to the beaded section, knitting in the beads is not particularly interesting. So this one will probably get done in little bursts over a long period of time. Tags: bamboo, cardigan, december, knitting, shawl, silk, Socks, wip | Permalink.